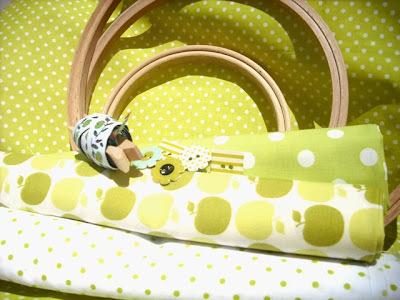 Os básicos de bolinhas que não dispenso e umas saborosas e suculentas maçãs granny smith da designer Sandy Henderson adquiridos na Dot Quilts. The usual polkadoted fabrics to go with some tasty and juicy granny smith apples from Sandy Henderson. This one was bought at Dot Quilts.